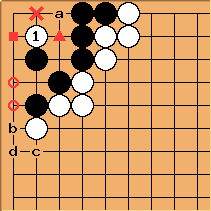 First let's imagine white plays as in the diagram. 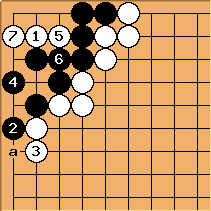 is a tesuji for connecting to the outside, but ko is possible. 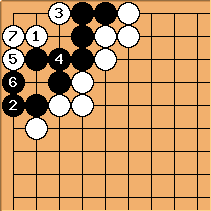 certainly is the key point here, a three-purpose play threatening connection to the outside, killing the black stones on the right, and killing rectangular six in the corner. More good news come from the shape point-of-view: has the special power of the (1,1). Furthermore it reduces the number of liberties of the strongest black stone/group to three, matching the number of its own liberties. With , no connection of any of the black stones can increase the effective number of liberties above three. The tigermouth however has the possibility of ko. 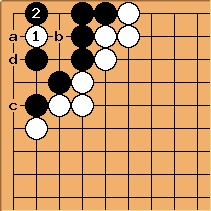 Regarding extensions, with none of Black's stones can increase their liberties anymore, while has three options to increase its own. Now let's imagine a black play at the key point . With that Black has a guaranteed eye space of four even for two consecutive white plays where the first is not a self-atari. That means, if there is a chance to kill Black, than only with at the key point. We already know that has three options for killing, and the longest sequence is two more plays. 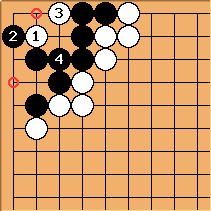 That means, that there has to be a black move removing two of these options at once, or Black will have to fall back to trying ko. The both cut the escape route and promise a second eye. removes the kill threat and also promises a second eye. only cuts the escape route, but it creates two options for eyes. Both are burdened with possible ko, but that means that one should succeed without further constraints. only promises a second eye (by dividing the rectangular six), but it also changes and to being double-purpose plays, both at once prohibiting escape of White and prohibiting kill of the right black group. Furthermore we see that and reduce the liberties of . does that too, but thereby also reducing the liberties of the right black group. 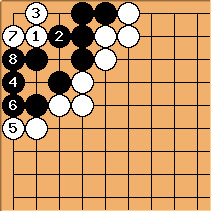 Finally is pushing to the weakest black group (The other stones would be as weak without the possibility of ko. ), while removes one possible attack move at a. reduces a to a possible ko. 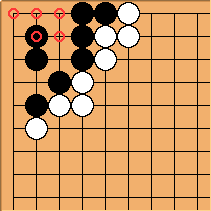 Black at b might be answered at c or d - or not at all, because killing the right black group with is already worth more than a ko for the complete corner (which then where the better option for Black). Now a and b are miai. If at c then at a; if at d then at b.
is preparation for reducing the following ko from a two-stage ko. After this is a race which Black can only win with a ko (White taking first; two-stage ko without playing first, because later White can answer directly at a). One of , or has to be on , otherwise at and Black looses the race by one. Black dies due to shortage of liberties. Seki due to shortage of liberties. If at , then ko with White taking first. After there are two key positions, both promising an eye and both being possible ko. There are a lot of continuations from here. 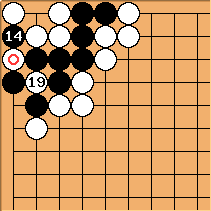 Also the problem is open, but this should be ignored for tsumego. and ko-threat exchange, on .